Product prices and availability are accurate as of 2019-04-15 17:39:56 EDT and are subject to change. Any price and availability information displayed on http://www.amazon.com/ at the time of purchase will apply to the purchase of this product. 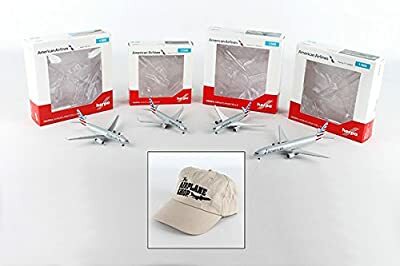 Set includes HE529648 AMERICAN A330-200 1/500, HE527606 AMERICAN 787-8, HE528276 AMERICAN 767-300, HE523950-002 AMERICAN 777-300 and Airplane Shop Baseball cap.